The 34.1 metre motor yacht Ascente has been listed for sale by JR Wills and Niel Steenkamp at Alexander Marine USA. Built in GRP by US yard Westport to a design by Gregory C Marshall, Ascente was delivered in 1994 as a Westport 112 model and had a complete interior and exterior refit in 2017. Accommodation is for up to ten guests in five cabins comprising a full beam master suite and four double VIP suites, all with entertainment centres and en suite bathroom facilities. A further two cabins can sleep up to four crewmembers aboard this yacht for sale. Her full beam main saloon has wrap-around windows highlighting the 300 degree unobstructed views throughout this area and there is also a full wet bar with three stools, a card table, comfortable seating and an entertainment centre including a large screen television and a stereo surround sound system. Forward is a large custom dining table with seating for 12 guests. The aft deck is ideal for entertaining al fresco, featuring a propane gas barbecue grill, fire pit and two tables surrounded by 12 chairs, and is fully enclosable in case of poor weather. Up on the sun deck is a four-person hot tub, two L-shaped settees and another propane gas fire pit. Twin Volvo TAMD 550hp diesel engines allow a cruising speed of 10 knots, topping out at 14 knots. 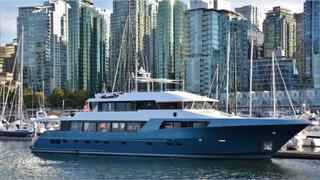 Lying in Coal Harbour, British Columbia, Ascente is asking $6,485,000.